The Gamble Plantation is mentioned in the Heritage section of your website, but I also consider it to be a significant tourist attraction. After the end of the Second Seminole War in the 1840's, the area around Bradenton and Ellenton became safe for settlers and the pioneers began showing up to farm and fish. A huge sugar plantation was started by Major Robert Gamble. The place had almost 3500 acres and was worked by almost 200 slaves. Gamble built a large mansion for himself and his family, and small quarters for his slaves. The slave quarters have disappeared, but the sturdy old mansion still stands with two foot thick walls made out of "tabby", a form of cemented coquina rock. The mansion was built in 1844, and has been restored and furnished in the style of a successful mid-19th century plantation. 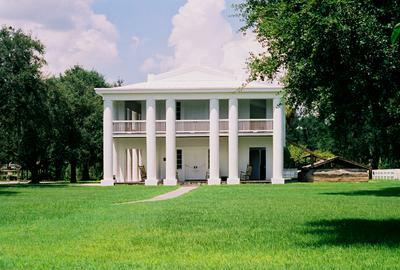 There are a lot of interesting things to see at Gamble Plantation. There is an old well near the mansion. The water table is very high in the area, and that was the old Old Florida way of getting water for cooking, drinking and bathing. There are also the ruins of the sugar mill not far from the mansion. The mill burned down during the Civil War. Major Gamble ran the plantation from 1844 to 1872 at which time he sold it to Major George Patton. The town around the plantation, Ellenton, was named for Major Patton's daughter Ellen. Gamble Plantation is the only surviving plantation house in South Florida. Confederate Secretary of State, Judah P. Benjamin, took refuge here after the fall of the Confederacy. He hid in the mansion until he could catch a sailing ship that took him to England. In 1925, the house and 16 acres were saved by the United Daughters of the Confederacy and donated to the State of Florida. It is now a state park and open to the public. Return to Tell Us About Your Favorite Florida Tourist Attraction.